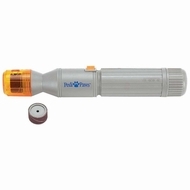 PediPaws is the revolutionary nail trimmer for your dog or cat. It’s the newest and fastest way to keep your pet’s nails trim rounded and smooth with no mess! Now you can easily trim your pet’s nails anywhere without the pain caused by traditional nail clippers. The secret is PediPaws precision emery filing wheel that gently removes thin layers of nail to leave your pet’s paws touchably soft and your home safe from scratches. The unique protective cap allows only the perfect amount of nail to be removed and contains all the filings so there’s no mess! Start treating your pet like one of the family. You and your pet will love PediPaws!